Honor a military veteran by displaying his/her American burial flag with a traditional veteran flag display case. Simple yet elegant, each US-made veteran flag case is crafted from quality oak wood and is available in classic oak finish. 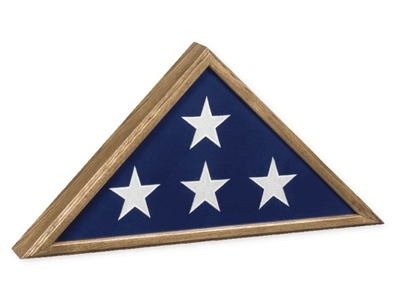 Your dust-protected veteran flag case also includes a free three-line basic brass nameplate. Inner Dimensions: 22 1/8" x 11" x 2 5/8"
The Veteran is the traditional flag case made from Oak with glass front. Removable back panel has turn-button closures.